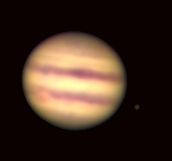 Above: Jupiter (with its moon Io) and Saturn as imaged by Astro 16 students with the Sproul refractor and CCD camera, November 2000. Welcome to the astronomy portion of the Department of Physics and Astronomy here at Swarthmore College. David Cohen, Professor of Astronomy. Eric Jensen, Professor of Astronomy. Physicist Tristan Smith, Assistant Professor of Physics, works on gravity and cosmology. Mary Ann Klassen, Senior Laboratory Lecturer. Physicist Michael Brown works on experimental plasma physics with applications to the Sun. John Gaustad, Edward Hicks Magill Professor Emeritus of Astronomy. For information about student research opportunities both on and off campus, check out the department's webpage about student research. And please feel free to ask any faculty member about getting involved in research. Swarthmore is a member of the Keck consortium. They host a yearly student research symposium in the fall and sponsor a student summer research exchange program. Sigma Xi gives out grants in aid of research - money to travel, etc. for research. Their application deadlines are March 15 and October 15. Our local Sigma Xi chapter also gives out (smaller) grants to enable students to attend meetings, as well as to support student research activities. In June 2010 we hosted the seventh Philadelphia Area Astronomers Meeting, affectionately known as AstroPhilly. In fall 2009 we participated in a series of events celebrating the International Year of Astronomy, commemorating Galileo's first astronomical use of the telescope, in 1609. This program, called No Night Without A Telescope, brought several hundred people to the Swarthmore campus and the Peter van de Kamp Observatory to hear lectures and look at Jupiter and other celestial objects. There are roughly five colloquia in the department each semester. You can access information about current astronomical events and the night sky. There is a telescope open house each month. It is on the second Tuesday of the month and is held from 8 to 9 PM when it is Standard Time and from 9 to 10 PM when it is Daylight Savings Time. We hold these open houses at the new Peter van de Kamp Observatory on the roof of the Science Center. Here is a map and directions. Note: We cancel the open house if it is too cloudy. We will post a notice on the department page, but sometimes not until the last few hours before the open house is due to start, as the the weather (and weather forecast) can change quickly. Astro 1 is our introductory survey course: phenomenology and motions of the sky, historical development of astronomy, planets, stars, and galaxies. It has six lab meetings. Next offered in spring 2014. Astro 16 is a calculus-based modern astrophysics course, generally taken by sophomores who are thinking of majoring. Juniors and seniors majoring in other NSE subjects often take this course and the occasional humanities major takes it too. Next offered in fall 2014. Astro 61 is a half-credit class in which we read and discuss articles in the research literature. Next offered in spring 2014. Sometimes we offer other astronomy courses. See the course catalog for more information. We offer three upper-level seminars, generally once each, every two years: Astro 121: Observational Techniques, Astro 123: Stars, and Astro 126: Interstellar Medium. Astro 121 is being taught in spring 2016, while 126 and 123 are being taught in 2016-17. We have sometimes also offered Astro 129: Cosmology. Students interested in upper-level courses on galaxies and cosmology are encouraged to take advantage of the offerings in the Haverford Department of Physics and Astronomy, notably Astronomy 342 and 344. Further, more detailed information is available in the course catalog and on the department's courses webpage.